There were 685 press releases posted in the last 24 hours and 153,519 in the last 365 days. DeForest Rathbone is a leader in the parent’s movement which has been active since Nancy Reagan’s campaign and responsible for a 50% drop in youth drug use. Additionally, the 2016 Surgeon General’s report stated, “Marijuana use, in adolescents in particular, can cause negative neurological effects. Long-term, regular use starting in the young adult years may impair brain development and functioning… And marijuana use—particularly long-term, chronic use or use starting at a young age—can also lead to dependence and addiction.” Thus also it confirms marijuana as a gateway drug. Further, annual national drug overdose death rates currently reported by the CDC, are skyrocketing at all-time high levels and increasing rapidly. 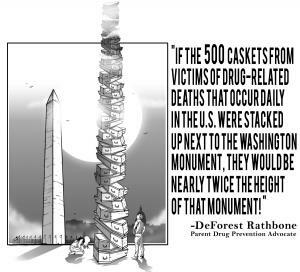 To illustrate the enormity of this U.S. drug death plague, if caskets of the 500 victims of drug-related deaths that occur daily in the U.S. were stacked up alongside the Washington Monument, they would extend to nearly twice the height of that monument! Every day, 24/7! Therefore, we parents urge our Governors and State Legislators to immediately recognize the imminent danger to all U.S. citizens from this unprecedented drug overdose death public health crisis. We ask you to end the drug-money fueled attempts to create and promote a dangerous marijuana industry in our nation. Instead we implore you to adopt protective laws such as those suggested in our Washington Times ad. Otherwise, those who continue to support the current headlong rush to enable and promote a federally-illegal marijuana industry in the U.S. will be shamefully responsible for continuing the dope-money-fueled destruction of our children, families, schools and communities throughout our country.